Is THIS.... the coolist spot on Earth? It is a federal law that all tourists coming to Florida must stop and see mickey at Mickeyworld. Literally streams and streams of traffic flow into the Orlando area everyday and now there is a new attraction. For those of us that love cars and racing stuff, this is the latest and without a doubt the coolest in place to be. Full of cars, hotrods, racing boats, Nascar cars, Racing and Automotive memorabilia, Motorcycles and pretty women. As you travel interstate 4, near Orlando, on the south side of the road you will see two cars hanging on a wall. This is the new Race Rock cafe, and something that you need to see. Entering this place is sensory overload. 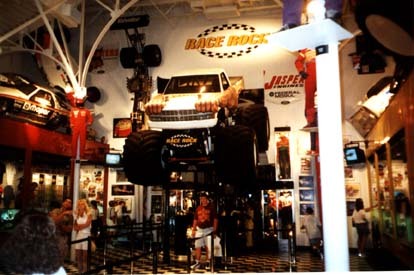 As you approach the hostess station, you look up and see a monster truck hanging off the wall over your head! You will spend a lot of time looking up, so get used to it. As you can see there are complete vehicles hanging in every corner in every direction that you look. Auto related themes are carried out in all aspects of the decor. For the stock car crowd there are full size cars up on ledges including Jeff Gordon and Dale Erhardt Also there are Rusty Wallace and Michael Waltrip hanging out on a wall. All kinds of racing machines are here including dragsters, cycles, boats, legend cars, indy machines, dirt bikes, funny cars, and a really neat bar area.